To our highly creative brains, a sound is never a sound. These vibrations that pervade our lives contain layers of meaning—a range of questions, intentions, and purposes. Even the absence of sound contains a world of uncertainty and curiosities, sometimes peace. 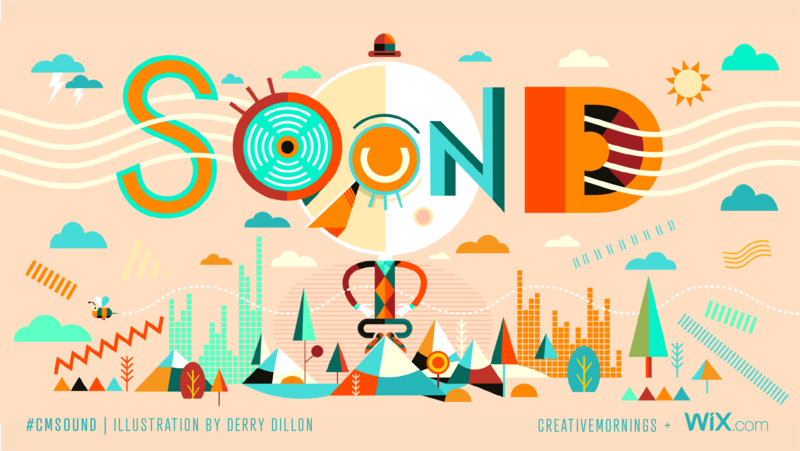 The theme was chosen by our Dublin chapter, presented globally by Wix, and illustrated by Derry Dillon. Christoph De Boeck Waveforms. About sound in visual arts. Joshua Williams and Abbo For the love of sound. Christina Irrgang Klang trägt Erinnerung und produziert zugleich Zukunft. Doing something really well and making it special – making it extraordinary – is a life’s work. Attention is a precious resource, and it’s one that every single person is fighting over. When I’m paying attention to sound, I’m thinking more about active listening. What are you hearing, versus what are you listening to? There are a lot of times where we go into something with a preconceived notion, a set destination, a thing that we want to happen. If you take a step back, and you’re actively listening, there’s a way that the stories and the moments unfold for you in a different way. I think music is an incredible experience that we can all enjoy. I want more people to go out to more places more often. When you’re existing and really experiencing that moment, that’s a higher plane to be on. In a world full of notifications and feeds, it’s more valuable than ever to really hold your experience and your awareness. I think now more than ever we really need amazing music venues that really allow audiences to pay attention and to listen. Who is the music for? What does it do to the listener? Is it ceremonial in some respect? What’s its purpose? What are you as the audience supposed to do when it’s happening? A lot of people grow up here and get tired of the lack of culture because of the city we're situated in & we're constantly overshadowed by Miami. So it's wonderful to see The Art & Creative Community growing here in my city. When you're recording a sound, you are taking a photograph of a moment. To make a living in life, find your passion and then find a way to make money. That way you will always enjoy your job. Everything vibrates in the world. We are not machines, we are human with vibrations of our Earth. We are always conditioned by some sound. To start talking about sound, we can't leave out talking about silence. There’s so much to learn. In the limited time we have together, I urge to you seek each other out...and learn these stories. Because, if it wasn’t for this, I would probably hate my brothers, but I don’t. I love my family and I would do anything for them, and I treat my community like my family as well. That self-examination is so critical, especially right now. We usually say: ”I will believe it when I see it” but in reality we see what we believe. Selama empat tahun, saya merenungkan semuanya; ternyata memang saya nggak [untuk major label]. Saya memilih untuk berkarir independen tanpa campur tangan dari pihak lain, karena yang saya kejar adalah - jujur saja, bukan terkenal, harus sukses - kepuasan disaat kita bisa bikin sebuah karya. Itu priceless. I really dislike the phrase being perfect. What does it even mean? I've rarely heard the phrase in conjuction with something positive. It's a really abstract concept. We are taught to think that we need to be greater, better, faster, more successful, more perfect, more, more, more. As we grow up we do understand that we never leave that place of learning but we seem to put so much more pressure on ourselves. Beethoven used to bite in a stick that was clamped to his piano frame, so he could 'hear' the vibrations through his teeth. The value of truth has completely changed now. All lunch money went to music. The different sounds that created me, help make me the artist I am today. The sounds of my neighborhood, like old school hip-hop, Aretha on my parents radio and Ethiopian church music. People that grew up in the great white north...you have to find a hobby in the winter or you’re never going to survive living in that climate. The really exciting thing to do is look at the mind as a canvass itself. So the idea is to give the visitors some space for deep sonic experience and see what it brings you. So when you are using artistic sound in the public space or in a half public space you can excite all the associations this person is having in the inner conversation they are having their whole life. There is his element parallel to our architecture that is the oral architecture. And with the difference between what is architect, in oral architecture you don't have one person. You can't pinpoint that this is the oral architect. A cave is a very complex sonic device. You can close your eyes and not see stuff but you can not close your ears and not hear stuff. Don't underestimate the power of nature. The thing about change is that it's less about introducing something new and more about unlearning something old. Our beliefs become the filter for how we interpret information from the outside. When the world changes around us, the knowledge, the thinking, the logic, the beliefs in an organization is just the knowledge of yesterday, developed to meet the challenges of yesterday. The real problem is when our own thinking is not in tune with the world around us. It's an even bigger problem if we are not aware of that. Change is just there, it's a given. It's always been there and it always will be. It isn't sound that we need more of, I think we need to take time out to be silent, reflect and investigate together. December 16 Дарця Тарковська. Do it yourself. В музыке и в жизни. December 23 Our speaker is... YOU!